Writing Blocked? Bust Through With Bingo! All writers, young and old, experience creative block at one point in their careers. Whether you’re writing for fun or for work, there comes a time when you just have to sit in front of your computer and try to squeeze the ideas out, to no avail. What are we to do when we just can’t think of a new topic or theme to write about? How about playing a game of Writing Prompt Bingo? Bingo has often lent itself to different causes and themes, allowing yogis to learn new poses with Yoga Bingo, and even helping gymnasts train. The game has seen newfound popularity, and Free Bingo Hunter, a website specializing in documenting various online bingo portals, has found hundreds of different bingo sites with different themes ranging from “Deal or No Deal” to “Who Wants to be a Millionaire”. With a few modifications to the traditional bingo card, we can create a bingo game that can help you power through the worst creative blocks. The first thing you have to do is begin constructing your card. 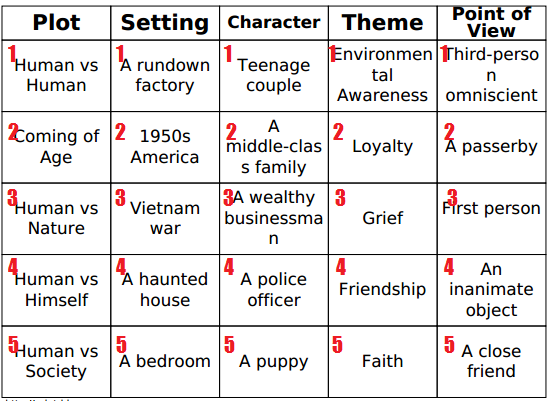 Pick five of the seven literary elements: Plot, Setting, Atmosphere, Character, Theme, Point of View, Literary Devices. If you need a quick refresher on these, Slideshare presentation does a good job of explaining them. To play the game, you just need to roll a die for each literary element. Whatever number you roll, you need to incorporate the corresponding element into your new story. If you roll a six, then you’re free to choose whichever element you want to write with. This game is great, not just for getting over writer’s block, but for challenging your skills as a writer as well. Now come on, y’all. That’s kinda brilliant, right? ← Never Too Busy For Writing Gems! Hmm. My control freak nature circles this idea with great caution. Fascinating but frightening. That is pretty great! I’m thinking it would work well for picture books, too. I’ll have to try this one! Oh, I think it’d be great for picture books, Debra–good luck! Cool idea. I think it would be fun to try it with microfiction! That’s an interesting idea to work through writer’s block. I have Deb Lund’s Fiction Magic card set, but this looks like a fresh idea to get ideas rolling. This is exactly what I needed to jump start my motor. Going to be fun.